Arnold Schwarzenegger doesn’t strut through action films these days. And no amount of editing can hide that no, grandpa can’t kick doors down any more. Or fake it. Even his line-readings have a fatigue that suggests he’s kind of over it. A once-bulky big boy of Hollywood’s steroid era, these days he just lumbers into scenes, chomping a cigar, and tries to let the younger, bigger actors carry the load. 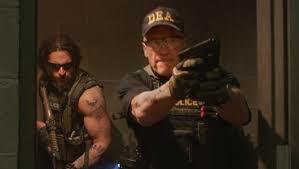 Schwarzenegger plays Breacher, the head of a DEA Special Operations Team, a gonzo gang of buff thugs with big guns and cute nicknames that they trot out in every slow-footed operation they mount. When we meet Breacher, Monster (Sam Worthington), his macho wife Lizzy (Mireille Enos), Sugar (Terrence Howard), Grinder (Joe Manganiello Tripod, Neck, Pryo and Smoke, they’re shooting their way into an Atlanta mansion run by a drug lord. And they’re robbing him. They stash the cash, but it disappears. Their bosses know there’s missing money. A long investigation (lots of grainy interrogation video) later, nobody’s charged. They get off with a scolding. That’ll teach’em. But then, the members of the team start meeting gruesome, spectacular deaths — by train, by nail gun. The movie spares us nothing, from the crime scenes to the grisly autopsies. An Atlanta cop, played by British actress Olivia Williams (“An Education”) slinging a Georgia accent, may be out of her depth. But she persists in trying to get the surviving members to tell her who is doing this, and why. Ayer plays around with time lines, having the cop and the not-exactly-disgraced Breacher enter crime scenes which flash-back to the actual events of the murder. Ayer throws a loopy chase through downtown Atlanta into the mix. And he and co-writer Skip Woods pour an enormous effort into the Budweiser, bullets and strip bars milieu that this “team” wallows in. Enos, of TV’s “The Killing,” aquits herself well — a tough broad amongst tough guys. Worthington has elaborate biker facial hair and an accent (He’s Australian) that comes and goes. “Avatar II” may not rescue his career after all. It’s more a botched Ayer movie than a retro Arnie adventure, but there are elements of both dragging this down. Extreme, graphic violence and a serious anti-law enforcement ethos mixed with flippant gun slingers executing bad guys and dropping the occasional bystander, giving more thought to their “zingers” than the body count. “Sabotage” makes you wonder, with nothing but flop star vehicles made for smaller and smaller studios since he turned 65, when this worn out Austrian war horse will be put out to pasture. Credits: Directed by David Ayer, written by Skip Woods and David Ayer. An Open Road release. Yeah, I thought this was terrible. Honestly, just felt bad for everyone involved. Especially Arnie. Good review. It’s awful. Arnold need to revisit his franchises… or this guy is finished. The real problem here is Skip Woods and the people who keep giving him work. I knew this movie would be trash once I saw his name attached to it. This is a man who kills franchises and careers. Ayer has made a stinker, here and there. But perhaps that’s the real kiss of death. Lurching from bloody crime scene to strip clubs — bad ’80s filmmaking. What is even more insulting to America is that Arnold is as the most famous steroid – illegal drugs – user in the world. 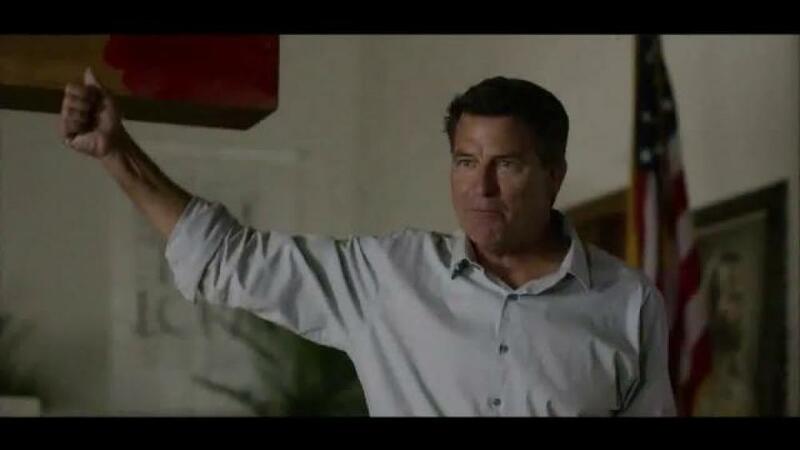 He is playing a DEA agent hunting his own real life suppliers? I think it is relevant that on March 12 2014, The State of Pennsylvania passed Resolution 626 which condemns steroid use, calls for education of coaches and student athletes but separates itself from from other proclamations by actually condemning three major steroid infested shows including “The Arnold Classic Strongman Show” that Arnold Schwarzenegger himself owns and shows up at every year in Columbus and now in various places around the world.